Coconut kale and lentil | Simply called "Food"
Last night I felt like having coconut milk, but usually I have it with tofu. I didn’t have any so I started to think what else can go with that. Maybe lentils. That was my second option for supper, but more as a salad. So what about combining both. I tried and it turned out well. 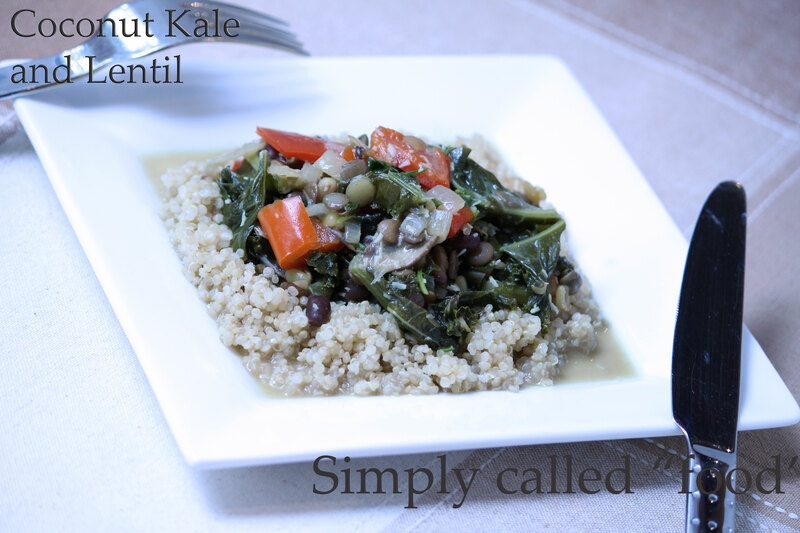 I actually made it like a stew with kale. I remember having it in coconut milk at Disney a few years back and that was the first time I actually liked kale, it was so tender and tasty and I didn’t know why mine was not like that. It was cooked in coconut milk but with tofu, surprisingly good! I made it with a side of quinoa. In a pot, heat the oil and stir in the onion. Then add the pepper, the mushrooms, the lentils and mix in the curry powder so it covers your vegetables. Put in your kale, some salt and pepper and cook for 2-3 minutes covered. Add the coconut milk and scrub the bottom of your pot to get all the juices. Then put the water and cook for about 20 minutes or until the lentils are fully cooked. At the end, sprinkle the coconut in your stew to give additional texture and flavour. In the meantime, prepare your quinoa or any other side dish and your meal is ready. It’s great on weeknights! Tags: Coconut milk, Food, Fruit and Vegetable, Gluten free, Kale, Legumes, Lentil, Recipe, Vegan, Vegetarian. Bookmark the permalink.